This is about as wild of a Nissan Skyline R34 GT-R as you will ever see. Dino Dalle Carbonare posted up this awesome set of pictures on this insane R34 at Speedhunters. Why do I call this the wildest R34 ? It cost a massive $350,000 to build and has yet to see the light of day on a race track. It all started back in 2006 when Hiroya-san, a very good customer of Garage Ito in Osaka, decided to see if he could challenge the lap time record at Tsukuba set by the HKS CT230R. 350k and it hasn’t even run. From the looks of it, its close to running, but just needs a few finishing things to turn a lap. If you looked at a lot of GT-R’s you would realize how far set back the engine was. If you know GT-R’s you would also know why this is so difficult. Heres a different angle from the World Challenge R34. Same titanium Nismo stut tower brace. Look at the relationship of the front cover to the strut tower brace in the Prostock car. The further you can put the weight behind the front axle, the more responsive the car will be. And that leads to the next item…the front axle. The R32 to R34 GT-R has the front differential built into the oil pan of the RB26DETT. You may not think that is much of a deal, except when trying to move the engine back as much as the Prostock car. The gold shaft running though the pan is the tube that contains the jackshaft for the left side axle. The Prostock car from below. The front differential has been pushed forward, and the axles still look like they aren’t straight. Not sure if that might hurt the car if it ever runs. Tubular front subframe. The tubular subframe has to drop some decent weight, and would make working on the car much easier. Then there is the suspension. Double wishboneish, blade style sway bar. Check out the steering rack mounting. Lots of car nerd sexiness going on there. The front suspension from a different angle. The front axles look like they might not last long at those kind of angles. More tubular subframes and double wishbone suspension. 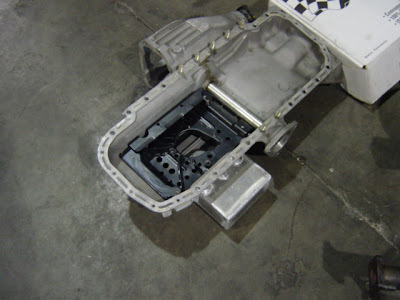 You can also see the ATTESA pump forward of the differential. A nice short, titanium exhaust. No coolers, nothing too strange. Steel braided line to the ATTESA clutch control. Sequential trans. Stock transmission mount. For about the last 3 years, this car has looked really similar to this. Hopefully they can eventually get this thing out onto Tsukuba for Time Attack , where it belongs.